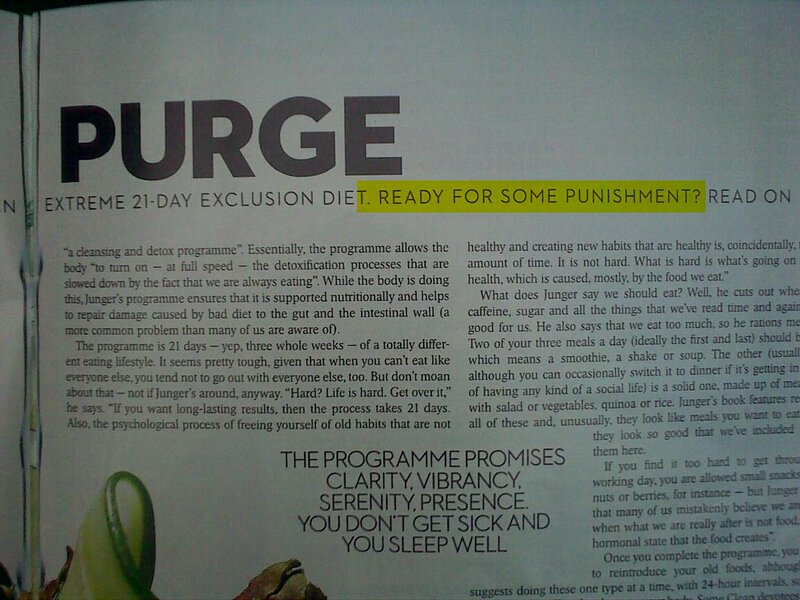 Then I flipped the page and spotted 'Ready for some punishment' (highlighted by me not the magazine) and settled down for read. Did it help me? Well I'm afraid not really, it was informatively written and had all sorts of diet suggestions....The Pregnant Pee Regime, Charcoal Diet, Mind Over Matter, Glacial Shell Therapy, The Hibernation Diet, Bentonite Clay Capsules... it went on. But nowhere did it suggest any method for making sure you stuck with whatever plan you embarked on (not that I fancied any of them, I think they're made up for women who lunch. But don't think). Not a hint of punishment, well not my variety. So I'm sticking with my own willpower and hopefully P's persuasive talents to underpin my efforts. Perhaps I'll email Edwina and suggest some of her readers might care to pop into my blog, I'll be reporting on my progress, they might find it an interesting alternative. Cheaper too. The comment aj made was "There will be less of you for P to enjoy spanking." He should know as he has 10 pounds to dispose of. A good spanking for every pound he has to loose plus the days he has it. So 70 with the brush this week. Good luck Ronnie. I wouldn't care for a colonic either, as a way of losing weight. Not my type of punishment at all! But other methods, hmmm. No, I'm afraid the only way spanking would help me control my eating habits is if I were to be threatened with NO spanking until I lost weight. Best diet I ever tried (I have to diet once every year) was one based on metabolic cycles. Basically it revolves around the fact that most people use up the calories that they eat early in the day but store calories from food eaten in the afternoon and evening. So you get to eat and drink as much of whatever you want between the time that you get up and 2:00pm, after two you do not eat anything and only drink water or tea and coffee without milk and sugar. It worked a treat when I was a student but I find it impossible to fit into my life when working, especially as I do not have the opportunity to cook at lunch time. Hope the spanking diet works. When you have a meal, use a smaller plate/bowl, then you can downsize the portion but the plate still looks full. Drink a glass of water before you eat EVERY TIME, even if its just a carrot stick! By the way, I can't remember ALL of them, but some veg use more calories by being eaten, than they contain...celery is one. Google it! Make up your own diet, just eat less than usual, and do more exercise, and bobs your uncle. Rachel - Ouch, 70. With the bath or hairbrush? I'll be thinking of him. Thanks. Stephani - Hi. I'm not on anything at the moment. I know I only need to loose a few pounds but nothing seem to work. I exercise, jog (a little). So hopefully P will give me some motivation, helped last time. Prefectdt - Sounds like that could work. I only have fruit for lunch at work and no snacking through the day. My down fall I think is I feel peckish around 10.00 pm and tend to eat something which is not a good idea to eat that late. I'm working on that. Daisy - Thanks for the suggestions but have tried all that. I have cereal for breaksfast, fruit for lunch, no snacking at all during the day. Dinner, chicken, fish, vegetables (yes some pots) sometimes pasta (my favourite but have cut it down) then yoghurt for dessert but still the pounds don 't move. Thank you all for stopping by. Enjoy your weekend. I am not even going to deny the fact that I am a comfort eater. So I need to control my stress levels, have some serious willpower, and look towards the goal..and that seems to work for me. Oh, and the little fact that if I do not meet target, my bottom meets with some form of implement..
Good luck with the diet..
Good luck Ronnie. My own motivator has been waiting in the wings, but so far his special form of encouragement has not been needed. Just knowing he's there has made all the difference! Raven - Good luck to you Raven I hope the implements stay in the draw. Sara - Exactly, you got it. knowing he's waiting in the wings in case needed. Thanks Sara. Good luck to you as well. Thanks both and sorry for delay in replying. Hope the weeks goes well.